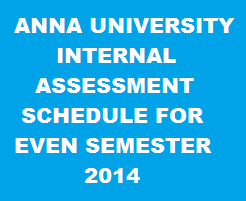 January 2014 to May 2014 Even Semester Internal Assessment Schedule has been announced by the COE of Anna University. As per the Schedule, today (02.01.2014) is the Opening day for all higher semester semesters and 20.01.2014 is the ReOpening day for II Semester UG/PG Students. For More details, check the following table for the brief timetable. Note: All the Colleges are instructed to enter the Attendance Details and Assessment Marks in the COE Web Portal as per the above schedule. Hall Tickets will be released promptly to those colleges strictly adhering to this schedule after the Registration in Web-Portal.